In another version of history, Where Hands Touch would have been the second film by British filmmaker Amma Asante. The director had recently finished her debut feature, A Way Of Life, a harrowing but sensitive portrait of racism set in contemporary Wales and told from the perspective of a working-class single mother. The story was somewhat inspired by a misunderstanding – after a conversation Asante had had with the late Welsh producer Peter Edwards, the first chairman of Ffilm Cymru Wales, the country's film promotion agency, and head of drama at ITV Wales. Long before diversity became an industry watchword, Asante had challenged Edwards about the TV channel's plans with regard to the representation of minorities. "I said to him, 'Wales has some of the oldest black communities in Europe,'" Asante recalls. "'How are you reflecting that on your television channel?' I thought – perhaps naïvely – that Wales must have something important to teach the rest of the UK about multicultural living, side-by-side. Peter said 'Not at all – let me tell you why,' and he opened a door into a whole world of race relations in Wales that I'd never contemplated before." As a direct result of that conversation, Asante was inspired to go deeper than the surface issues of race, mining a more universal subject matter – identity – that surprised many viewers with its sympathetic portrayal of a very unsympathetic character. . There is, quite deliberately, very little that's black and white in A Way Of Life; instead, Asante chose to focus on the shades of grey that exist between. Nevertheless, this theme of community was something she intended to return to. "That idea of the oldest communities in Europe had always sat with me," she says. "Being the child of immigrants who came from Africa – but having been raised in Europe – I've always been interested in other people like me in history. The standard view is that we all came over on the Windrush" – the ship that brought 500 immigrants to the UK from Jamaica in 1948 – "and that was it: that's how multicultural Britain started, or even multicultural Europe started. But I was really fascinated with what came before that. I felt nobody had really told the story of who we might have been in Europe prior to the Windrush.."
So the director started researching the issue, and one day she came across an image on the website of the United States Holocaust Memorial Museum. "It was a photograph of a young bi-racial girl standing with her 'classmates', who were all white and presumably Aryan," the director recalls. "It was taken in around 1943 or 1944, and she had an unreadable look on her face. I didn't know what to make of that look, and that posed some interesting questions. Who was she, who could she be, why was she there? Why was she in MunichBerlin, or even in Germany, during this period, under Hitler? What did this all mean?" This was not quite what the director had expected to find. "To be honest," she says, "I really hadn't contemplated the fact that there were people of colour who existed in Germany at that time. I knew that later there were African-American soldiers stationed there, and even African and North African soldiers, that fought in World War II. I certainly knew that, but I didn't expect to find European black people (those born in Europe) who were existing under National Socialism. To put things into context, this was just a few years away from apartheid being introduced legalised in South Africa. Black people were still 'strange fruit' in America. We hadn't even got to civil rights yet. Everywhere you could possibly look, where people of colour had to be integrated into other societies, we were completely at the bottom of the food chain. This young girl's image was listed as being taken so late into Hiltler's rule, that I imagine, based on his modus operandi and the context of Black people's treatment around the world, this girl would be gone, not allowed to attend school, and certainly not standing around other young girl's that were regarded in that society as 'Aryan'. And so thisat was striking to me, and a bit confusing, because it was a slightly different angle on a story that we all think we know so well." Asante went to work, thoroughly researching the period, sketching out a story, and fleshing it out the characters. "I actually went to live in Wales to finish the script, because I found that I had to create my own bubble so I could send myself back off into that world – the world of 1944 Berlin – and create the story in the way that I wanted to." At that time, she expected to have it written and wrapped within five years. Instead it took nearer 12, with two more films – 2013's Belle and 2016's A United Kingdom, sandwiched in between. "I'd hoped it would be my second film," she says. "I'm glad it wasn't now." To start the process, Asante spent "a lot of time just going through the basics". She recalls, "In the same way that I had to with A Way Of Life, before I could even attempt to tell this story, I had to understand this social, political context of 50, 60, 70 years before – the events that led up to the world that I was then about to platform my characters on. I was spending a lot of time reading through the transcripts of the Nuremberg Trials, going through testimony after testimony, to get further under the skin of the real stories. I was listening to children's stories, teenagers' stories, young people's stories, and then just going through the various age groups. Men's stories, women's stories – what were the differences?" Once she'd started to get a better shape of this world ("As much as you can when you're looking back on history and you're not a part of it"), – Asante hired a researcher. "That's when we started to get really, really specific," she recalls. "We worked with through the Wiener Library in London, the United States Holocaust Memorial Museum in Washington and Yad Vashem in Jerusalem. It was a question of trying to get direct experience stories from the horse's mouth, as much as possible." These initial contacts with the museums were first online interactions first, using their open sources, before eventually visiting them in person – at the Weiner Library we would take photo copies of as much research as possible that we wouldn't be able to take away or find easily anywhere else, if at all. We used Yad Vashem's resources extensively and then visited the museum in person later in the process to solidify what we had learned. As our research was developing, we visited camps – Auschwitz-Birkenau, Sachsenhausen, later Terezin. The majority of stories, she found, were those of Jewish survivors of the Holocaust. "We found some stories of Gypsy survivors, and then a few the odd storiesy of gay men," says Asante, "but I couldn't really find any stories of any people of colour. So we started to try and trace black survivors of the Holocaust – and, finally, we were able to. Then I flew to Germany to speak with them." As interview subjects, they were very different. "One of them made it an important part of his life to talk to young people and tell his story – he now has his memoirs in print, but he didn't at the time. But then one of the ladies I spoke to had never really spoken to anybody before. She'd spoken to some researchers, or historians, but had never, to the best of my knowledge, given talks or told her story in public, as a speaker. She was a little bit nervous – I think of the world in general – but she was open to me, and perhaps actually more comfortable with me, because I was black and I was female, which made it a little bit easier for her to tell her stories. We had some great conversations." Through her research, Asante learned of the existence of a generation of mixedrace German children, who were the offspring of German mothers and French- African soldiers stationed by the French government on the German border – The Rhineland - , after World War I as part of the occupation. Says Asante, "Whether or not this was actually the case, we don't know, but Hitler apparently thought that the French had put those men there on purpose, in order to demean and bring down Germany and the German race. You have to remember the humiliation that Germany felt it had suffered – losing the first war and having the occupation. After World War I, it was a crippled state, and part of the reason why Hitler was able to bring the country on side for a Ssecond Wworld Wwar was the promise of regaining the national identity, its honour, and taking revenge for the humiliation that had been caused them." Against this backdrop of desperation and disillusionment emerged a very small but significant generation of children of colour. "One thing is clear," says Asante. "These children would have already been irritating to Hitler anyway, because they were children of the enemy – the children of the French. The fact that they also had African roots, which came via the French colonies, was seen to be not even a double insult but a triple insult in many ways. They were known as the Rhineland Bastards, but at the beginning of their lives, their existence was not necessarily terrible. It was not necessarily awful. They had loving mothers who remained loving and protective throughout their lives. They were in loving communities in the countryside. It wasn't until later on, as they got older, that they became deemed as being more dangerous by the powers that be, simply by virtue of being able to get married and have children – being able to procreate, really. So Hitler took action, setting up a secret section of the Gestapo to quietly have these Rhineland children taken from their homes, school, anywhere they could be found, and have them sterilised before being sent back home, to continue life. It was a precarious a life for some however. Mostly, if they kept their heads down, they might be fine, but if they met the wrong SS man on the wrong day, who knows what might happen, either based on rules he might use or simply operating outside of any rules. Nothing was absolute or straight forward." Taking cues from her in-depth research, Asante began to develop her storyline, a microcosm of life in Germany during the Second World War. Says Asante, "I really wanted to look at the lives of fairly ordinary Germans who existed in situations that, at times, it appeared there was no way out of. If you didn't send your kid to Hitler Youth, you were deemed an enemy of the state and there would be a price to pay for that. It wasn't as if there were any Aryan parents who were able to say, 'No. I don't like this organisation. I want to keep my son away from this.' Children had to go, and they were expected to tell on their parents if their parents didn't stick to the doctrine. When we think back into terrible times in history, we like to think that, if we'd been there, we would have been a hero. But most of us wouldn't, and the reason we have heroes is because they're rare." Asante adds, 'It's a scary thought and I wanted to look at what happens in situations when there are no heroes.? I wanted to look at what happens when you love your country but profoundly disagree with how the government is running it – the things they are saying, actions they are taking, groups they are 'othering'. How do you harness your power to do something about that….or not! Similarly, I wanted to look at how a society can sleep-walk itself into, not only hatred, but into a state that determines a whole portion of its citizens, it's own people can and should be removed. I wanted to look at culpability and complicity of individuals through fear, inertia, selfishness , versusvs what emerged as a lack of taking responsibility by society. With all this in mind, I wanted to look at what happens when you are growing up, a child about to become a young adult, against the madness of this backdrop. For me, being Black isn't an island. Moreover our Blackness sits in a context of the everyday issues within the world and time we are living in, and so I always want to place my characters in the social and political contexts that they exist within, not to keep them separate from how they impact the world and how the world impacts them, how they fit into the world, and world fits into them." 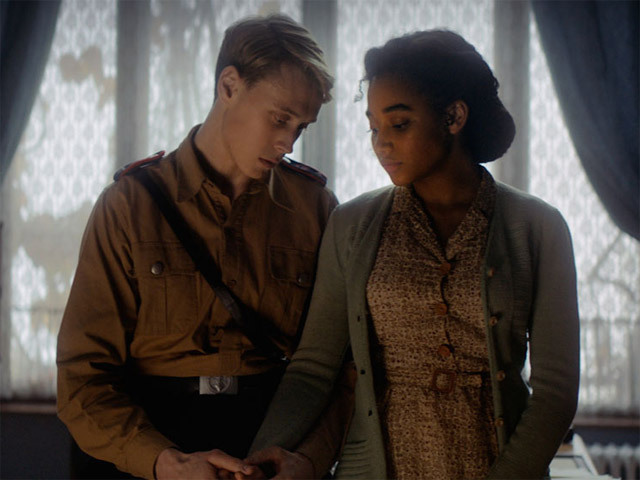 These elements fused into Where Hands Touch, the story of Leyna, a biracial girl who lives with her mother and younger brother in the German countryside. After an encounter with Hitler's secret police, who are searching for Leyna to implement the sterilisation order, destroy Leyna's identity papers, the family moves to Berlin to avoid the sterilisation fate focused on the Rhineland children, and , where Leyna's mother Kerstin thinks they will be safer, hiding in plain sight. The German capital has officially been cleared of its Jewish population, as a gift to Hitler for his birthday by this point, though in reality a very few Jewish people still exist in Berlin, who are about to be removed. Hitler Youth has been forced on all children and their parents by the National Socialist government and Leyna is surrounded only by the children left in city, who are Aryan and attend the organisation. In the German capital, Leyna meets Leyna meets one such teenager, Lutz, a Hitler Youth boy whose mother has died and who is being raised by his father, an SS officer. For a short while, Kerstin's instincts around safety prove correct, true, but as the ever-more-desperate war encroaches, Leyna's eyes are opened to the horrific extent reality of Hitler's genocide. Explains Asante, "What the story really pivots on, I think, is the idea of what happens when you are existing in the grey areas. Leyna is not Jewish and she's not Aryan. At that time, you either belonged to what Hitler had created as the right side or the wrong side, in terms of survival, and Leyna Leyana is neither. She lives in this untested area." Worth adding here that Lutz is also operating in grey area, forced into situation by the regime and battling with his own identity. After Asante finished the script, she soon realised that she was in for a long wait, possibly because of the weight of the themes her script dealt with and almost certainly, as a young female director with only one film to her name, because of financial issues. Nevertheless, Where Hands Touch created a buzz, and while Asante waited patiently, the script was exchanged frequently within the UK film industry, being passed around by producers, agents and even actors, who lobbied Asante for the male and female leads. Significantly, the script was a major factor in Asante's hiring by Damiaen Jones for what would actually be her second film in 2013 – the period romance Belle, which starred Gugu Mbatha-Raw in the true story of a mixed-race girl adopted by a rich white family in London during the last days of slavery. Notes Asante, "If Where Hands Touch had been my second film, there would have been no Belle. Belle came along because everybody had read the script for Where Hands Touch and thought that I'd be a good person to create the world of this 18th-century, biracial girl." Funnily enough, without Belle, it is possible that Where Hands Touch would not have found its Leyna – long before she began to consider rising new actress Amandla Stenberg for the role, fate was already at work. Recalls Stenberg, "Our first interaction was basically when I actually reached out to Ammaher over Twitter. I was a fan of her work and I wanted to speak to her for a project that I was working on for my feminism class – I wanted to interview people that I look up to, especially women in creative spaces. And she was someone who came to mind, because I'd seen her work – I'd seen Belle, and absolutely loved it. I loved seeing black women in history. So I reached out to her, and we had a little bit of back and forth about the idea, and the questions I was going to ask her." "Amandla," Asante recalls, "was among a lot of teenage girls that had written to me after Belle, who were wanting to interview me for their school projects and so on. I had wholly hoped to go ahead and do that interview with her, but I was so busy doing publicity for Belle that I hadn't managed to. As far as I knew at that time, she was just another one of these young girls who had contacted me." Then, perhaps a year to 18 months later, Asante was flicking through Instagram when she came across a statement about cultural appropriation that Stenberg had made and which had gone viral. Around that time, Asante posted a comment on social media, saying, "If I had a child, that child would be Amandla Stenberg." Says Asante, "I was thinking, 'Wow, who is she?' So I Googled her a little bit more. I saw that she was a young actress – she was in The Hunger Games – so I looked at the other films that she had done, then suddenly something struck me about the name. I felt I'd seen it before, in my inbox somewhere, so I went through all my inboxes, scrolled back miles in my Twitter inbox, and I found her message." "In the meantime, Amma had actually started to follow me online," says Stenberg, "and had never really made the connection that I was the same girl who had asked her to be a part of my feminist project." It was during the editing process of Asante's third film, A United Kingdom – a drama about the unlikely but ground-breaking interracial love affair between the President of Botswana and a typist from Croydon – in early 2016 that Asante began to consider Stenberg for the role. "It struck me: Why haven't I thought about this young woman as Leyna?" she recalls. "It's probably because I hadn't thought of an American – I was obviously going down the British or European route. It suddenly dawned on me that I should really be investigating this." It wasn't, however, a done deal. "What I wasn't convinced of was how Amandla could play in this kind of European drama, and what her accent would be like, and also whether she could translate into the world, into this period European world, which was so different from anything I'd seen her in before, and so different from the world that she knew and understood. But she's so bright, and so talented, that it was very clear once I sat down and spoke with her about it, after we sent her the script, that she understood it. She understood what I was trying to do with it, which isn't always the case. People often take their preconceptions of that particular period and run with them, and not necessarily recognise the complexities and nuances that a film like this is quite determined to explore, and why. Amandla understood them immediately." Asante invited Stenberg for a meeting, where they simply chatted. Afterwards, Asante sent her to meet Charlie Hanson, the film's producer. "She did her whole first chat with Charlie in an English accent," Asante recalls, "because we'd decided that we weren't going to try to do a 'real' German accent. We were just going to try and add a lilt to an RP British accent – we were trying to create our own world of an accent, which was relatively uniform. There was never any problem with Amandla's ability to act the part, it was just going to be a question of her being able to have the accent at the same time." Surprisingly, Asante had no qualms about offering a leading role to a 17-year-old girl with just a handful of film credits to her name. Why not? "Well," she explains, "I have some sort of political, with a small P, beliefs when it comes to that. I don't know why we need to feel so safe, why we find ourselves in a place where we cast the same people over and over and over again. I'm also aware that there are thousands, millions, of people out there who have the ability, but because of who they are, where they were born, what access they do and don't have, will never get the opportunity to do that. I try to not be afraid of giving people opportunity." For Where Hands Touch, Asante was more concerned that the actress she hired should have the right balance of emotional intelligence and youth. "I was more worried that I'd have to cast somebody who was older than Leyna," says Asante, in order that they could understand the complexities of the script. I was worried that we'd have to go older, and I was far more concerned about that than having a girl who had never played a lead before. I was more worried about having somebody who was too young emotionally to be able to carry this role. The first thing that I was convinced of, with Amandla, was that that was not going to be her problem." Nevertheless, there were extensive casting sessions, with other young women. Explains Asante, "I had to be able to compare Amandla amongst the European black girls that were available and see how she held out against them. It was important for me to see other young women, partly for me to make sure that I really was giving it to the best person who could handle the role, but also because I had to choose carefully. If I'm giving an important European role to someone outside of Europe, I have to have a good reason for doing that." After landing the part, Stenberg was both excited and daunted by the opportunity that the film presented. "Of course I was nervous," she admits. "This is definitely one of the most challenging roles I've ever taken on, and it was equally challenging in terms of material, which itself is so rich and heavy. I was working on a movie right before Where Hands Touch, and it looked for a while that I wouldn't be able to do the role, because of the time-overlap. And, of course, it was crucial – because the material was so sensitive, and so heavy, and so nuanced – that I should have adequate time to prepare." After Leyna, the second biggest role to fill was that of Leyna's mother Kerstin, which went to Australian actress Abbie Cornish. "I'd met Abbie on one of my trips to Los Angeles when we were selling A United Kingdom," Asante recalls, "and her agents asked if we would see her for the part. She came to visit me at my hotel, and I just remember looking at her and thinking, 'You're way too beautiful, and you're way too young. What are they thinking? Why are they sending you to me?' But there was a quiet calmness to her. [A United Kingdom star] Rosamund Pike has it, Gugu Mbatha-Raw has it. They have – and I get goose bumps when I think about it – a kind of quiet dignity that I just find really compelling. It's something that I'm really drawn to, and I don't know why. Perhaps I recognise it from somewhere in my childhood, but it draws me." Cornish had been attracted to the project after reading the script. "It was just so amazing," she enthuses. "As an actor, every now and then a script comes along that is just so beautifully crafted that it bounces off the page and turns straight into a movie. This was one of those scripts. Even when we were shooting we never really changed anything, and for me that's a sign of a pretty great script." Cornish remembers the meeting well, and that she was drawn to both the director and her story. "Amma's great, because you can talk really deeply very easily with her," she says. "We had a real understanding and connection, both to the story and to the character and her life, even her time. It was really interesting. I mean, I'm 34, so I wouldn't have been around in the '40s. But for some reason I felt incredibly connected to that era in so many ways. I remember travelling through Europe and visiting concentration camp museums in Germany and being incredibly affected by them, the history and the stories from that era. We mostly discussed that period of history, but we also discussed race, gender, and motherhood, as well as the primal, instinctual element of survival." Asante came away from that meeting impressed but still thinking Cornish probably wasn't right. "We hadn't cast Amandla at that time," she says, "and I felt that Abbie wouldn't be old enough to have a 16-year-old daughter, even though she's supposed to be young when she has her." Cornish confirms that this was always one of the director's main concerns. "One of the things that Amma said to me," she recalls, "at least two or three times over our initial meetings, was, 'Are you OK playing the mother of a 16-year-old and a nine-year-old? Can you do that? Are you comfortable with that?' I said, 'You realise that I'll be playing someone two years younger than myself, right?' So for me, it was like playing someone two years younger that had lived a whole other life to me. And, weirdly enough, it didn't feel that far away. I don't have children myself, but I love kids, and I spend a lot of time with them – my friends' children, my nieces and nephews. I have a 25-year-old brother and a 22-year-old sister, so I was a teenager when they were growing up. It didn't feel that much of jump." Asante didn't take long to come around to the idea. "Abbie was like oil on my hands," she laughs, "I couldn't quite wash her off. We were talking to other actresses at the time, quite big names, but I couldn't quite get rid of Abbie from my thoughts. Eventually we did a Skype, and I fell in love with her even more." For the part of Lutz, the Hitler Youth boy who becomes smitten with Leyna, Asante had her own preconceptions of what that actor would look like. "I thought I was looking for somebody who would seem completely Aryan – blond, with those Aryan blue eyes, the sort of thing that we know that Hitler was looking for. I'd pretty much got it down to three young men, having seen lots through our casting director, Toby Whale. Toby, who had also cast Belle, said to me one Friday, 'Look, just before we offer it, I would like you to have a look at George MacKay, because he's filming in Spain at the moment, he's sent a self-tape, and I just think it's worth you looking at it. I want to know that you have looked, you've seen everybody that I think is worth you seeing, before you make that decision.'" That weekend, Asante was due to visit her husband in Denmark. "I was exhausted," she recalls. "I thought, 'Oh, for goodness' sake, I more or less knoww who who I want, and the struggle is going to be which of these three boys, and I don't want to add a fourth into the mix, because that's just going to complicate things.' I got home, and I watched his self-tape, and I just remember my jaw opening." "I'd put on tape a scene with Lutz and Leyna," MacKay recalls. "It's the scene where they dance together for the first time in his father's office, and they have a conversation about what the Nazis are doing to the Jews." After a flurry of phone calls, MacKay was offered the part. "That's how it went," says Asante. "I thought I was coming back for a weekend of looking at these three young men's self-tapes and working out all the reasons why it would be right to go for one or the other. But George came in and just moved the others off the page. Not because they weren't brilliant, but because he was so brilliant." Asante says, "'Lutz, also, in his own way - totally separate and distinct, to Leyna, is walking in the space between society's definition of him and the way he defines himself. His government expects him to be a murderer, to deliberately murder innocent people – a definition that he does not wish for himself – a definition for him, that does not make him a soldierlider or a man of honour. At the same time, he has to separate himself from the tale he's been raised on, that he has thrown himself as a child and then teen, into believing – that WWII is about regaining the honour stolen from Germany by the enemies and redressing the inequities after WWI and the Treaty of Versailles. He has to work out what his identity means as he becomes clearer eyed about the Nazi agenda and what it really means. I wanted an actor who could balance that, not for pity….but who could find a truth of what that might have been like."". While the actor was still in Spain, Asante called him via FaceTime. "The signal was dodgy for a long part of it," MacKay recalls, "but it was just so wonderful to hear her speak. She's so eloquent, and front-footed, and articulate about the themes that she wants to tackle, and that she wants the story to tackle." The last piece of the main jigsaw to fall into place was Christopher Eccleston, who plays Lutz's father, Heinz, an SS Officer. "Chris was the last one of the four that we found," says Asante. "I think he gets bored of people saying this, but I've loved Chris since Our Friends In The North. I was a teenager, maybe just about hitting my 20s, when that show first appeared on BBC Two2. It affected my storytelling psyche, although I didn't know at the time, because I didn't know I was going to be a storyteller, but I liked the world that it played out in. I liked what it was doing as a piece of work, I liked how it was doing it, and I liked how Chris played his role in that show, so he's always sort of lived under my skin since then. And when my casting director suggested him as Heinz … I hadn't really thought of him prior to that, and I thought, 'Oh my God, yeah.'" Eccleston's agent swiftly arranged a Skype call. "We spoke about the role," the actor recalls, "and we spoke about the importance of the father-son relationship. I have two small children, so the idea of acting a storyline with my son being much older was very appealing to me. I mean, I'm in my dad years now, so we spoke about that, and we just, generally, had a chat – which is very important on a project like this, because the director needs to feel, and the actor needs to feel, that, socially, you're going to get along, that you have the same reference points, etcetera, and your personalities are complementary." Again, the offer was made swiftly, leaving little time for rehearsal and research. "I think I was probably on set within two weeks," says Eccleston. "Because of its subject matter, this was never going to attract a great deal of funding, and funding leads to rehearsal. But that's a virtue – Amma is not trying to tell the same standard stories that Hollywood keeps churning out. And if you're going to do that, you're going to have to do it on a shoestring, and that inspires the work." As was the case with Asante's two previous films, Belle and A United Kingdom, Where Hands Touch is set in a very specific time period. But although the director is meticulous about her own research, Asante respects the concerns that some actors have about over-researching their roles. "I generally let the actors find their way in whatever way is necessary for them," she says, "so you do get some actors who want to know a lot, and they'll go out and they'll do their own research – and Lord knows, sometimes that can be problematic! But other times it really is useful. But if an actor doesn't want to go out and do too much, I'm there for them, and I will provide them with a timeline of their own history. It's not a full-on bible. I'm not into that, but I'll tell them what year they were born, how many sisters or brothers they have, whether they're from the world of farming or the world of factories. I'll give them that." Asante's input proved essential to Stenberg, who came to the project almost directly from the set of romantic drama Everything, Everything, an adaption of a Young Adult novel in which she plays a girl with a debilitating illness. She recalls, "I ended up wrapping on the other production, going home for a couple of days, and then flying directly out to Brussels – actually on my 18th birthday. I thought, 'OK, it's go time – I need to focus on this now.' I wrote extensive notes on the plane, and when I arrived, we had about a week or so, or maybe little bit longer, to prepare. So within that timeframe we just did the best we could, really going through the material, poring over it and talking about each scene. I did a lot of research when I got to Brussels – Amma helped me, sent me documentaries to watch and books to read – because there's no way you can tell a story like this without having a proper knowledge of the history of the Holocaust." Stenberg says she found Asante's support during this time invaluable. "We would only move on to the next scene after we'd both gotten what we needed," she says. "Amma's such an incredible collaborator in that way that, even though it was scary that I would not have more time to prepare, she has such a high standard, and approaches everything with so much love, that I always felt I had the safety net of her judgment." Asante helped Stenberg deal not only with the reality of her character's situation but to get to grips with one of the film's key themes: her identity. "In many ways, Leyna's just a teenager," says Stenberg, "but she's experiencing teenager-dom under tragic, but also kind of relatable, circumstances. I mean, there are many parts of her story that I think anyone can identify with, like falling in love, or trying to figure out who you are. But then, of course, Leyna's circumstances have made her the person that she is. She's felt very isolated her whole life as the only child of colour in her village. She's been left alone by her community, until she reaches adolescence, and then her race becomes more of a problem in society. Suddenly she has to look persecution dead in the face and recognise that the nationality that she identified with in the past is not what she thought it was." Key to Leyna's journey is her mother Kerstin, whom Asante believes has a somewhat "karmic or even quite holistic view of the world". "Kerstin's a 32-year-old mother of two in World War II Germany," explains Cornish. "She has a 16-year-old biracial daughter by a black French soldier and she also has a nine-year-old German Aryan son by a German man. But she's single, and she's living alone with her kids. For the rest of the movie, her daughter is coming of age and at the same time learning about love and life and herself. It's a really interesting story about love, in all its different forms – family love and romantic love." Cornish felt that research was essential – but only to a certain point. "I always do a lot of research and a lot of reading," she says. "But once we started shooting, I relinquished all that. As soon as I got to set, I knew that I had to give it up because I needed to step inside that world and tell a living, breathing story." To play the part of Lutz, the Hitler Youth member and trainee soldier who falls for Leyna, George MacKay embraced the chance to revisit the history of the period. "One of the most amazing things about this job was the amount of research that there was to do," he says. "It was just a pleasure to have a history lesson, and also to learn it from the other side. I wasn't into history that much at school, I didn't take it on to GCSE level, and, even then, what I did know of the war, I knew only from the English side. The main thing that I wanted to learn, and which I began with, was trying to understand his headspace." MacKay cites Adolf Hitler's 1925 autobiography Mein Kampf as a useful tool when exploring the twisted psychology of the time. "Because although the logic within it is atrocious and bigoted," he explains, "Hitler sets this thinking out quite logically. He had a mathematical understanding of emotions. He knew that people would be willing to die for the subjective not the objective, which means they are more likely to sacrifice themselves for a feeling rather than a reason. It makes an awful kind of sense, and the research was really just a way of trying to understanding that logic – trying to find a way into that logic that would kind of allow me to understand it and not always be at arm's length from it." MacKay's character is also conforms to Hitler's ideology in other ways, later courted by joining the Waffen-SS, the military wing of the Nazi party, though he does not join. "So I also researched the idea of what the Waffen was, and the idea of being a super-soldier," he says. "Boys are naturally competitive, but when you're constantly being told that you're the best of the best – especially with Lutz being an Aryan – that sense of competition only increases. These boys were so fit – they trained all the time." To help with the physical aspects of the job, MacKay hired a personal trainer. "Lutz has a sort of boy-to-man journey," he explains, "and I wanted to physicalise that change as much as possible. All the exercises I did beforehand were the kind of bodyweight exercises that these boys would be doing. My trainer would give me exercises to do throughout the week, like, 'Get up, pack a backpack as full and as heavy as you can and go for a run with it. And then at three points throughout the run you need to crawl on your belly for at least two minutes, preferably in the woods rather than at the gym.'" During filming, however, the training became more intensive. "Initially, the exercise makes you feel really good," says MacKay." You feel lean and kind of flighty. But then you start eating more, and lifting weights, and you suddenly feel a bit heavy, and cramped up and bulky. And that's the idea we were working with: by the end of the film, Lutz is no longer happy in his own skin, he's not happy with what he's now become a part of. Whereas when he's in the Hitler Youth he is so pleased and honoured and privileged and proud to be where he is and who he is." For Christopher Eccleston, the part of a senior-ranking Nazi was unexplored territory – prior to this, he'd only had a small part as a German officer in Martin Sherman's harrowing play Bent at the National Theatre in 1989, with Sir Ian McKellen "But apart from that," he says, "I think the nearest I've got to this period is 1950s post-war Britain in a  film called Let Him Have It." The wartime period fascinated him, he says, "But wasn't a complete surprise to me because, in my 20s, I read quite a lot of literature dealing with the facts of the concentration camps, because of [an Italian-Jewish] writer called Primo Levi, who wrote If This Is A Man, The Truce and so on. He touches on the stories of the minorities, if you like, who were in the camps along with the Jewish people." Other than that, Eccleston was reluctant to over-study the part. "I'm not a research junkie," he says. "I felt that it was all in the script, because, in the end, it's a universal story. Yes, it targets a specific time in history, but it is a universal story about love and difference. You could see it as Romeo and Juliet story, in this context, and of course my character's relationship is, again, a universal one – he's a father who loves his son very much and he's trying to keep his son alive. So you have to play the humanity of it. No matter how much history and detail you read about, you have to play the human relationship and you have to show that onscreen. Fortunately, myself and George had a real bond." In revisiting such a horrific moment of 20th-century history, it was vital for Asante to create a safe and inclusive set. "Amma is definitely one of the best directors I've ever worked with," says Cornish. "She has such a wonderful way of communicating with everybody – not just the cast but also the crew. And I think because her vision is so strong, and it's so beautiful and artistic, that everyone just jumps on board to make that vision come to life for her. And when we did, it was so rewarding. She's such a beautiful, kind heart, and she's so loving, and so powerful as a woman, in in the most wonderful way. She's quiet on set – she just says what she needs to, but it feels comfortable. You feel like you're at home when you work with her. There wasn't one time while I was away that I felt 'away' – I always felt that I was part of something and that I had a great collaborator and also a great teacher. I really learned a lot from her." As well as her director, Cornish quickly established an easy rapport with her onscreen daughter, whom she first met at the airport as they made their way from Los Angeles to the set in Brussels. "Amandla and I got along from the very first second we spent time together," she says. "It was just meant to be. It was very interesting, because we'd go to work and we'd slip into these characters, and we'd talk to each other, still using the accent, throughout the day. So it wasn't like we were coming in and out, we were going to work and staying in these characters, in these lives. Even if we were just hanging, we kept a little flavour there, in the accent or even just in our relationship, then, on set, we would shift the dynamic, because I was playing her mother and she was playing my daughter. It was really interesting – I would be doing a scene with her and I'd just feel this energy, which was so different to our dynamic outside work. Then we'd go back to the hotel, have dinner, and we'd best friends again, talking about a life and art and boyfriends… It was really fascinating how we could do that." Stenberg is happy to return the compliment. "I absolutely loved working with Abbie," she says. "Working with her was just so cool because, even though we are in no way related – and I am biracial – it was really interesting to see the ways in which we actually were alike, and shared mannerisms and had priorities that were similar. There was a natural connection there when it came to us being able to connect as mother and daughter as well as actresses." Asante encouraged a similar level of intimacy and chemistry between Stenberg and MacKay. "Thank God for Skype and FaceTime," says the director. "We did a lot of talking before shooting started, one to one – myself and George, myself and Amandla, Amandla and George. We talked a lot. We had a week of rehearsals in Belgium, but we were constantly Skypeing and FaceTiming prior to that, just so I could be sure everybody was on the same page and had the same understanding of what this film was to be about and why." MacKay felt a definite bond. "Amandla is truly wonderful," he enthuses. "Such an incredible person and actress. She and Amma are very similar, in terms of how articulate they are and how focused they are in their views and in getting those views across. By the same token, that can sometimes sound forthright, which can be a very good thing, but their views are about understanding. I was just so impressed and honoured to be around them, all the time, truly, just as people. Amandla is so in touch with the world, and so curious about it." The two would frequently go through their scenes the night before shooting. "Which is sometimes rare," says MacKay. "We wouldn't necessarily rehearse, but we'd run the lines and go over them together just so that we were learning them together. We'd discuss the beats, so that we had our own sense of things before getting to set. And so to share that was really cool, because oftentimes you don't do that. It kind of gave us more of a shared insight into each of our characters' journeys, we worked it out together. I don't want to speak for her, but I think the whole character became very ingrained in her, and that's through a mixture of conscious effort and craft. She wasn't Method acting the whole time, she would come in and out of the character. As an actress, she just met the challenge of the role – which was to carry the story." Stenberg confirms this version of events. "Both George and I really tried to immerse ourselves in the story, and so a lot of the time we'd only speak to each other as the characters," she recalls. "And I'd say for the majority of the time that I was there, I was more in character than I was myself." Central to this were the production design, wardrobe and hair and make-up departments. Says Stenberg, "In period films, these elements are crucial, in terms of helping you feel in the moment and part of that time. We were able to shoot in really beautiful areas of Brussels that still felt like they hadn't been touched in a long time. It was so bizarre to be walking down the streets that our production had dressed with large Nazi flags hanging from the rooftops (perhaps worth clarifying the streets had been dressed) .It was a film set I know, but I never thought I would see something like that in my lifetime. In terms of the clothing and the environment, it felt so authentic." For Cornish, the look of her character was an important part of accessing her personality. "My hair in the film is really, really blonde – Aryan German blonde – and the hair and makeup people also bleached my eyebrows," she says. "So I have this very sort of open, vulnerable face, but with some hardness to it. It gave me a more period look, and also a more German look, but it also stripped the performance right back down to the eyes, which was really lovely too, so that the acting could just happen through the eyes. I didn't really wear much makeup in the movie at all. Just a little bit of a base and that's pretty much it. "What I liked about the wardrobe and make-up," she adds, "was that it felt right. I never wore something or had my hair done and thought, 'This is weird.'" For the men, the costumes had a more profound significance. Recalls Christopher Eccleston, "I had an interesting experience when we were shooting in Belgium – in Mons, actually. I was stood down for a while, so I wandered off into a cafe, forgetting that I was wearing a uniform. I swear, two or three people visibly jumped. I didn't understand it for a moment and then I realised: it was the uniform. It strikes terror. The potency of that uniform still resonates." Nowhere, however, were the physical elements of the production more effective than in the latter half of the film, when Leyna, without her papers and separated from her family, is arrested and taken to a work camp. Says Stenberg, "The first half takes place in the summertime, so it's a very idyllic type of environment." The second half, however, could not have been more different. For these scenes, the production moved to the Isle of Man, where a replica camp was constructed. Even though it was merely a set, it affected the cast deeply. "When I saw the camp for the first time," says Eccleston, "I reacted in the same way that those people in the café reacted to seeing me in the uniform – it was visceral. I felt physically sick. It was very, very shocking." "That environment was so barren and cold," Stenberg recalls. "We spent most of that portion of the film freezing cold, covered in mud and dirt and not having adequate clothing. Now, that in no way equates to the suffering that people who actually experienced the Holocaust went through. But it did allow me to have more of a perspective on what it must be like to endure such dehumanisation, and degradation while dealing with actors dressed as Nazis. It wasn't in any way an abusive environment, but just those factors allowed me to think even more deeply about what it would have been like to experience something so horrific." MacKay singles out for particular praise the extras in these scenes. "I think everyone was really invested in this film," he says. "It was emotionally exhausting some days, but that's exactly as it should be. All the background artists that we had in the camp were extraordinary. Their morale never broke. They'd all shaved their heads, and they'd be sitting with a picnic blanket over them in between takes, trying to keep warm in the bitter cold." Surprisingly, such a harsh environment did not distract the cast from the task at hand. Says Eccleston, "When you're an actor, you experience that, then you dismiss it and get on with the job because that is the job. It's counterintuitive, but you can't afford to get too emotional – that's for the audience. I don't want to lead the audience. I just want to present what Amma has written." Though it features a love story of sorts, Asante knew that Where Hands Touch could never be romantic. "When it came to writing the end of the film," she recalls, "I knew that Leyna and Lutz couldn't be together. The idea that the British and the Americans are coming, and that's going to be the end of the war, doesn't mean that the end of anti-Semitism, or racism, is coming. The fact is, when Jewish people were trying to get to the UK prior to what we know happened in the camps, for a while, Britain didn't let them in. In terms of France putting African soldiers into Germany as part of the occupation, it wasn't because they knew something amazing about Hitler being racist – it was because all of Europe was racist. Nobody wanted groups of African men living and thriving on its shores. Nobody wanted that, so the idea that suddenly the camps would be liberated, and this would be a world in which Leyna and Lutz could live, was simply not a given." possible." For the cast, the experience of making the film was similarly sobering. For George MacKay, it was a chance to reflect on privilege, and white supremacy even in a more modern society. "To be perfectly honest," he says, "what this kind of production has taught me is that, as a young white male, there are so many things that I don't feel, or I'm ignorant to. In my journey through life, there's been so little put in my way – things to do with my gender, or my ethnicity, or my sexuality – that I thought, I have to do this – we're looking at the big questions here.'" Similarly, the experience affected Abbie Cornish both physically and emotionally. "We were all changed after we made this movie," she says, "in more ways than one. It changed us and it changed our lives. After we finished the movie, there I was with these bleached-out eyebrows, really blond hair and this very pale skin, because I'd stayed out of the sun. I looked at Amandla, and she didn't even have any hair – she was so dedicated to the role, she'd shaved her head." Her biggest takeaway from the film, Cornish thinks, is its contemporary relevance. "What's interesting about this story," she says, "is that even though it's set in the mid-1940s my profile, it could be set in the present. It's so contemporary, in so many ways. So the story itself actually didn't feel that far away. In America and all over the world, we're all going through to a tumultuous political time. It gives us a very specific story to focus on during a time in history that was painful and tragic, and it puts a lot of parts of humanity and society under the microscope – race, gender, patriarch, war, love, life and death. The big questions – it really takes a close look at all those things." Her co-star Christopher Eccleston agrees. "I think it's the duty of art to offer truth," he says. "But, that said, human beings always find hope. So I would like audiences to take some hope from it, about the love between these two people, their bravery, and the bravery of people of colour who tried to survive that horrendous regime. There are lots of parallels in our society today, and I think the film is very timely in that way. Since the Second World War, there has always been brutality, dictatorships, inequality… We've not moved on that far, have we? You only have to look at Syria. We've not moved on." For Amandla Stenberg, the film offers a reminder of the need for compassion in a world where, once again, ordinary people are being encouraged to find scapegoats in minorities. "I hope," she says, "especially considering the political climate of today's world, that people will take away from this film an understanding of, or a connection to, people who are persecuted. Something Amma said that struck me was that the people of Germany were so easily manipulated into complicity with Hitler's atrocities because it was so hidden from them that they couldn't recognise the terrible things that were occurring in their own country. This movie is really, really relevant considering today's political climate. So I hope people are reminded of what happens when we don't stand up for the others in our communities, when we don't stand up for every single person who makes up our country." Meanwhile, for Amma Asante, all those things blend and are encapsulated in Leyna's journey, as the young innocent comes of age in the most horrific circumstances imaginable. "Leyna's journey, really, is to come to understand her identity," she explains, "and understand her role in a society that has begun to eat its own tail. It is turning on its own people. She pauses. "Does that sound familiar?"